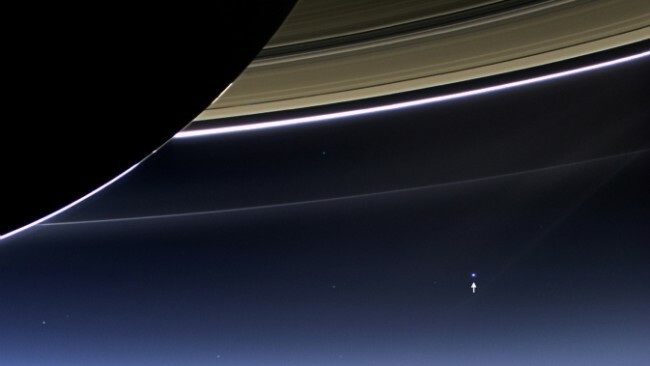 You could be forgiven for thinking the image below is of Earth. Rather, it is Saturn’s largest moon, Titan, as imaged in infra-red by NASA’s Cassini spacecraft on November 13, 2015. Gorgeous. Image: Composite image shows an infrared view of Saturn’s moon Titan from NASA’s Cassini spacecraft, acquired during the mission’s “T-114” flyby on Nov. 13, 2015. Courtesy NASA. Our results indicate the presence of a negative mass anomaly in the south-polar region, largely compensated by a positive subsurface anomaly compatible with the presence of a regional subsurface sea at depths of 30 to 40 kilometers and extending up to south latitudes of about 50°. The estimated values for the largest quadrupole harmonic coefficients (106J2 = 5435.2 ± 34.9, 106C22 = 1549.8 ± 15.6, 1?) and their ratio (J2/C22 = 3.51 ± 0.05) indicate that the body deviates mildly from hydrostatic equilibrium. The moment of inertia is around 0.335MR2, where M is the mass and R is the radius, suggesting a differentiated body with a low-density core. 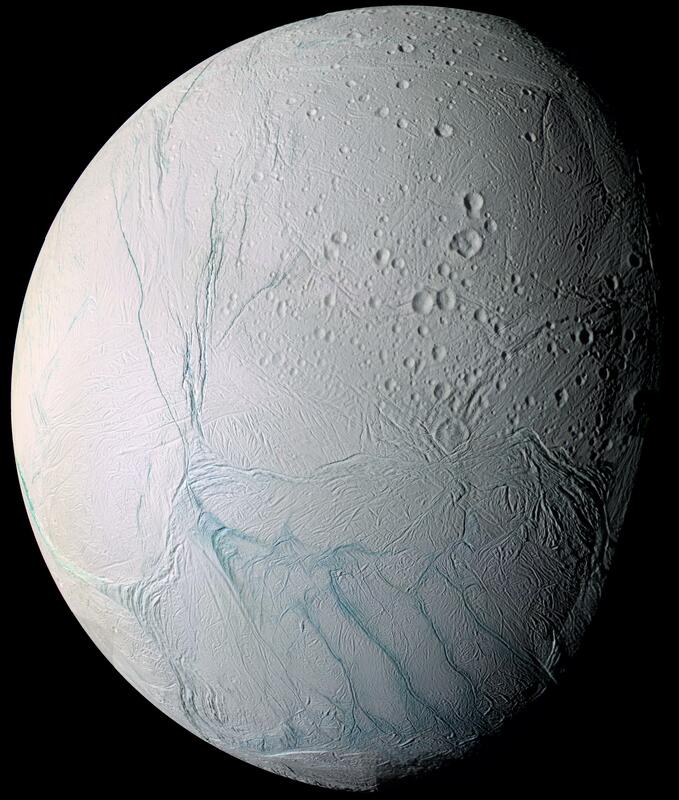 In effect this means that the researchers are reasonably confident that an ocean of water lies below the icy surface of Enceladus, one of Saturn’s most intriguing moons. Inside a moon of Saturn, beneath its icy veneer and above its rocky core, is a sea of water the size of Lake Superior, scientists announced on Thursday. 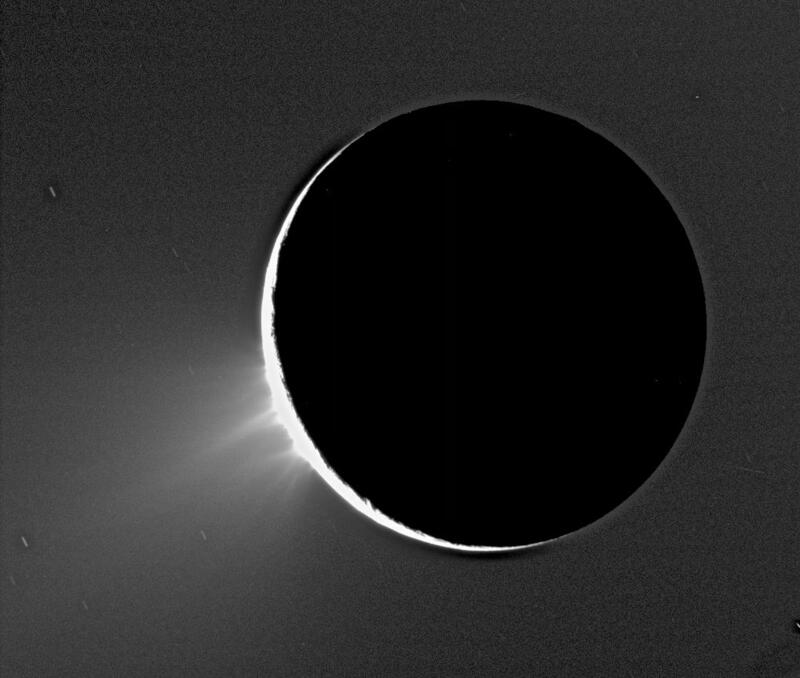 The findings, published in the journal Science, confirm what planetary scientists have suspected about the moon, Enceladus, ever since they were astonished in 2005 by photographs showing geysers of ice crystals shooting out of its south pole. “What we’ve done is put forth a strong case for an ocean,” said David J. Stevenson, a professor of planetary science at the California Institute of Technology and an author of the Science paper. For many researchers, this tiny, shiny cue ball of a moon, just over 300 miles wide, is now the most promising place to look for life elsewhere in the solar system, even more than Mars. 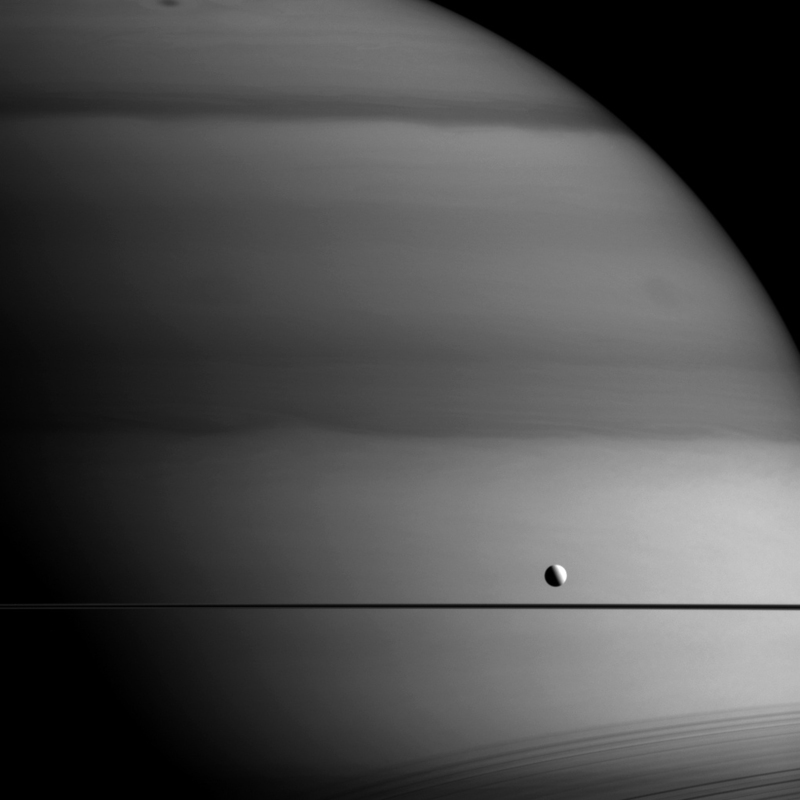 Enceladus (pronounced en-SELL-a-dus) is caught in a gravitational tug of war between Saturn and another moon, Dione, which bends its icy outer layer, creating friction and heat. In the years since discovering the geysers, NASA’s Cassini spacecraft has made repeated flybys of Enceladus, photographing the fissures (nicknamed tiger stripes) where the geysers originate, measuring temperatures and identifying carbon-based organic molecules that could serve as building blocks for life. Cassini has no instruments that can directly detect water beneath the surface, but three flybys in the years 2010-12 were devoted to producing a map of the gravity field, noting where the pull was stronger or weaker. During the flybys, lasting just a few minutes, radio telescopes that are part of NASA’s Deep Space Network broadcast a signal to the spacecraft, which echoed it back to Earth. As the pull of Enceladus’s gravity sped and then slowed the spacecraft, the frequency of the radio signal shifted, just as the pitch of a train whistle rises and falls as it passes by a listener. Using atomic clocks on Earth, the scientists measured the radio frequency with enough precision that they could discern changes in the velocity of Cassini, hundreds of millions of miles away, as minuscule as 14 inches an hour. They found that the moon’s gravity was weaker at the south pole. At first glance, that is not so surprising; there is a depression at the pole, and lower mass means less gravity. But the depression is so large that the gravity should actually have been weaker. Liquid water is 8 percent denser than ice, so the presence of a sea 20 to 25 miles below the surface fits the gravity measurements. “It’s an ocean that extends in all directions from the south pole to about halfway to the equator,” Dr. Stevenson said. It also makes Enceladus a more attractive destination for a future mission, especially one that would collect samples from the plumes and return them to Earth to see if they contain any microbes. Image: View of Saturn’s moon Enceladus on July 14, 2005, from the Cassini spacecraft. Courtesy of NASA / JPL / Space Science Institute. Some regions of our planet are home to violent and destructive storms. 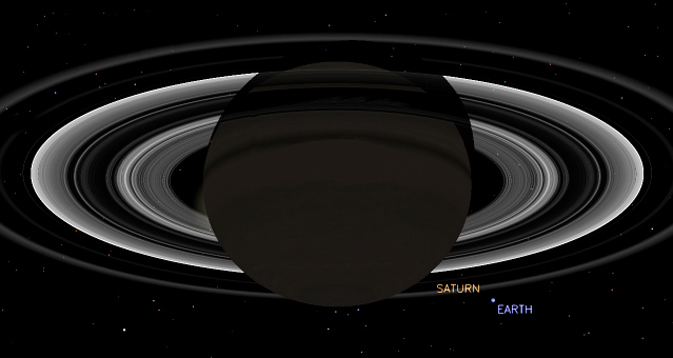 However, one look at a recent mega-storm on Saturn may put it all in perspective — it could be much, much worse. Jupiter’s Great Red Spot may get most of the attention, but it’s hardly the only big weather event in the Solar System. Saturn, for example, has an odd hexagonal pattern in the clouds at its north pole, and when the planet tilted enough to illuminate it, the light revealed a giant hurricane embedded in the center of the hexagon. Scientists think the immense storm may have been there for years. 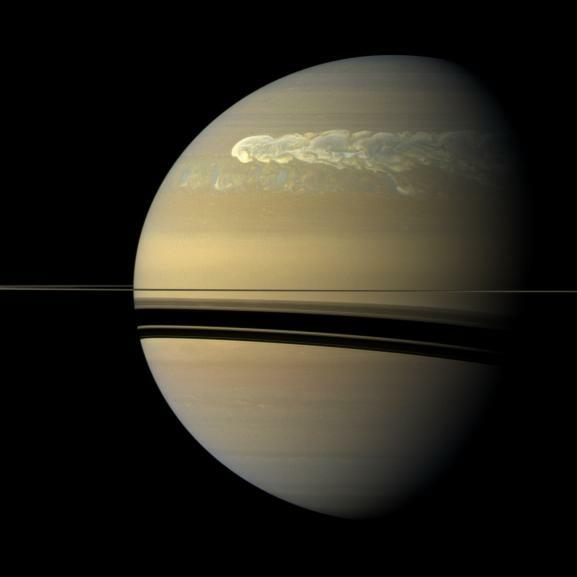 But Saturn is also home to transient storms that show up sporadically. The most notable of these are the Great White Spots, which can persist for months and alter the weather on a planetary scale. Great White Spots are rare, with only six having been observed since 1876. When one formed in 2010, we were lucky enough to have the Cassini orbiter in place to watch it from close up. Even though the head of the storm was roughly 7,000 km across, Cassini’s cameras were able to image it at resolutions where each pixel was only 14 km across, allowing an unprecedented view into the storm’s dynamics. The storm turned out to be very violent, with convective features as big as 3,000 km across that could form and dissipate in as little as 10 hours. Winds of over 400 km/hour were detected, and the pressure gradient between the storm and the unaffected areas nearby was twice that of the one observed in the Great Red Spot of Jupiter. By carefully mapping the direction of the winds, the authors were able to conclude that the head of the White Spot was an anti-cyclone, with winds orbiting around a central feature. Convection that brings warm material up from the depths of Saturn’s atmosphere appears to be key to driving these storms. The authors built an atmospheric model that could reproduce the White Spot and found that shutting down the energy injection from the lower atmosphere was enough to kill the storm. In addition, observations suggest that many areas of the storm contain freshly condensed particles, which may represent material that was brought up from the lower atmosphere and then condensed when it reached the cooler upper layers. The Great White spot was an anticyclone, and the authors’ model suggests that there’s only a very narrow band of winds on Saturn that enable the formation of a Great White Spot. The convective activity won’t trigger a White Spot anywhere outside the range of 31.5° and 32.4°N, which probably goes a long way toward explaining why the storms are so rare. Image: The huge storm churning through the atmosphere in Saturn’s northern hemisphere overtakes itself as it encircles the planet in this true-color view from NASA’s Cassini spacecraft. 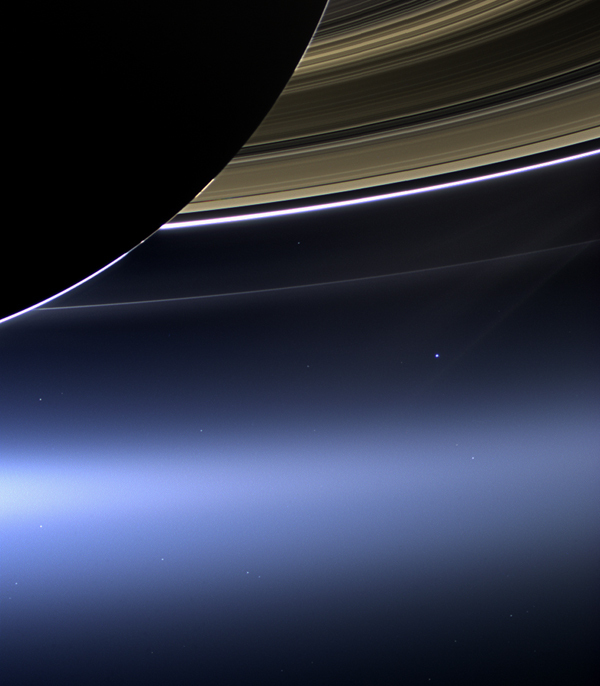 Courtesy of NASA/JPL. The image show s what looks like a satellite picture of a river delta, complete with tributaries. It could be the Nile or the Amazon river systems as seen from space. However, the image is not of an earthbound river at all. 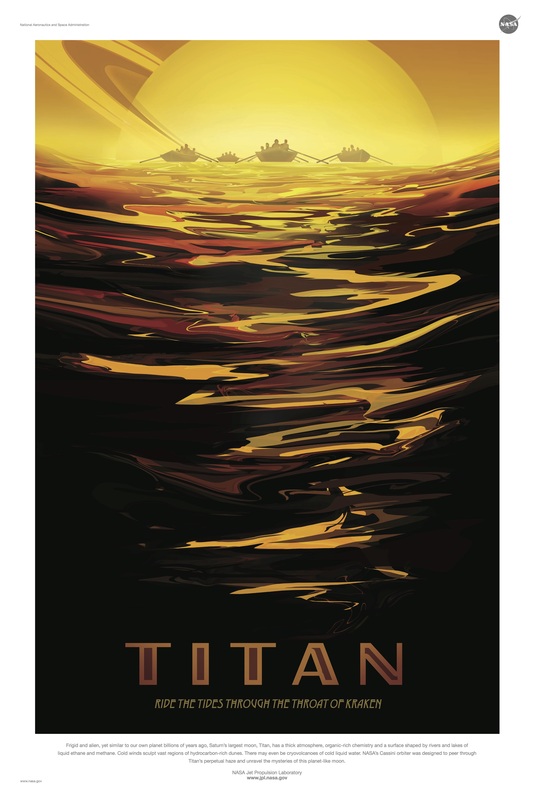 It’s a recently discovered river on Titan, Saturn’s largest moon. And, the river’s contents are not even water, but probably a mixture of liquid ethane and methane. Scientists deduce that the river is filled with liquid because it appears dark along its entire extent in the high-resolution radar image, indicating a smooth surface. 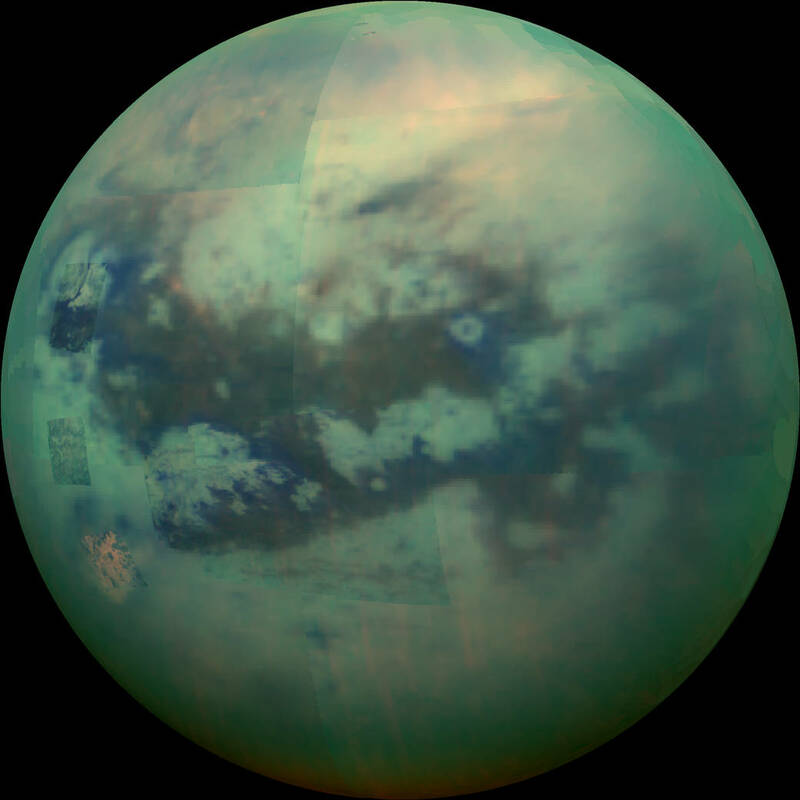 That liquid is presumably ethane mixed with methane, the former having been positively identified in 2008 by Cassini’s visual and infrared mapping spectrometer at the lake known as Ontario Lacus in Titan’s southern hemisphere. Though there are some short, local meanders, the relative straightness of the river valley suggests it follows the trace of at least one fault, similar to other large rivers running into the southern margin of Ligeia Mare (see PIA10008). Such faults may lead to the opening of basins and perhaps to the formation of the giant seas themselves. North is toward the top of this image. The Cassini-Huygens mission is a cooperative project of NASA, the European Space Agency and ASI, the Italian Space Agency. NASA’s Jet Propulsion Laboratory, a division of the California Institute of Technology in Pasadena, manages the mission for NASA’s Science Mission Directorate, Washington. The Cassini orbiter was designed, developed and assembled at JPL. The RADAR instrument was built by JPL and the Italian Space Agency, working with team members from the US and several European countries. JPL is a division of the California Institute of Technology in Pasadena.